Go on, why not sponsor this page for $5.00 and have your own message appear in this space. coal mines, but he began umpiring sandlot games during a strike to pick up extra money. 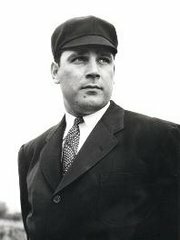 Barlick began his professional umpiring career in the Northeast Arkansas League in 1936. He worked the Piedmont League in 1937 and 1938, and the Eastern League in 1939. He moved up to the International League in June 1939 and made it to the major leagues as a National League umpire in the fall of 1940. On November 5, 1943, Barlick entered service with the Coast Guard. He served aboard a Coast Guard cutter in the Atlantic and returned to umpiring in 1946. With a booming voice, decisive hand signals, and an excellent knowledge of the rules, Barlick served the National League for the next four decades. He umpired seven all-star games and seven World Series. He retired in 1972 after 33 years and was inducted into the Baseball Hall of Fame in 1989. Barlick served as a National League consultant form 1972 to 1994. In May 1995, his uniform No 3, was retired at Wrigley Field in Chicago. Al Barlick passed away at Memorial Medical Center in Springfield, Illinois on December 27, 1995. He was 80.